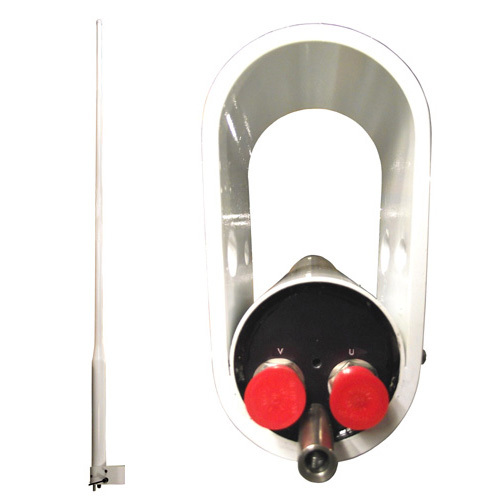 The D2282 is a VHF/VHF/UHF/UHF dual frequency air traffic control military MULDIPOL™ antenna for ground-air-ground, air traffic control and base communications applications. The VHF input/outputs operate in the 116 to 150 MHz frequency band and the UHF from 225 to 400 MHz. Available in White or Olive Drab. TACO Antenna's multiple output antenna design offers the operation of up to four stacked dipoles operating simultaneously within one radome, with a high degree of isolation between elements. The design has excellent broadband characteristics over the entire operating frequency.